When people speak about the “energy transition” they mean de-carbonisation and its associated changes, however another fundamental change in the market is taking place at the same time: the digitisation of energy. Technology is enabling more and more devices to be networked, allowing people different ways of controlling and managing both their environments and their lives and businesses. This trend presents opportunities and threats for the energy sector. “Smart” demand-side response (“DSR”): load shifting could provide 185 GW of system flexibility, potentially saving US$ 270 billion of investment in new electricity infrastructure that would have otherwise been needed. In the residential sector alone, 1 billion households and 11 billion smart appliances could actively participate in interconnected electricity systems. Integration of renewables: digitisation can help grid operators to better match energy demand to intermittent production – in the EU alone, increased storage and digitally-enabled DSR could reduce curtailment of solar PV and wind power from 7% to 1.6% in 2040. “Smart” charging for electric vehicles (“EVs”): shifting charging to periods of low demand/high supply, and providing flexibility services to the grid could save US$ 100-289 billion in avoided infrastructure investment between 2016 and 2040 as grids expand to accommodate the increased loading from the electrification of transport. Small-scale distributed energy resources: digitisation can facilitate development of distributed energy resources, such as household solar PV and storage, by making it easier for producers to store and sell surplus electricity to the grid. Technologies such as blockchain could help enable peer-to-peer electricity trading within local communities. The Internet of Things (“IoT”) has been a hot topic for some time, but is yet to really come anywhere near meeting its potential – so far IoT technology has primarily been about fitness trackers and remote domestic heating/lighting control, with the occasional “smart” fridge. One of the major challenges inhibiting IoT take-up is lack of standardisation, but at some point the market will converge on a standard set of protocols. As more devices and appliances become networked, their DSR potential will grow. Globally, the IEA estimates that about 3,900 TWh of current electricity consumption is technically available today for demand response – this is expected to almost double by 2040 to about 6,900 TWh, or nearly 20% of global electricity consumption. DSR potential varies by region and sector, but in all regions, most of the current and future technical potential at lower cost lies in the buildings sector, especially in space and water heating and cooling, since thermal inertial allows demand for space heating and cooling to be shifted over a number of hours. Most of the remaining potential in buildings is related to electricity used for large appliances, such as washing machines, refrigerators, dishwashers and clothes dryers, with EVs expected to be major contributors in future (see below). Alongside the connectivity of devices and appliances sits the need for smart metering both at the grid connection, and at the asset or appliance level. This applies both the generation (dispatchable and non-dispatchable) and appliances or processes that consume electricity. Accurate consumption and generation data enable more efficient use of the assets and appliances, which may mean new assets or infrastructure investments can be avoided. The combination of big data management and machine learning provide the means by which this can be achieved – big data management allows the terabytes of data collected from generating assets and demand centres to be analysed in real time. Advanced analytics and machine learning are used to develop forecasts for asset availability and behaviour, design of bidding parameters in ancillary market auctions and development of forecasts of balancing mechanism market prices, as well as demand patterns. Asset operation and consumption patterns can both be optimised based on these forecasts, capturing value from market prices at all points in the forward curve right up to imbalance pricing, as well as participation in balancing, ancillary services and capacity markets for both generation and demand-side response. In the IEA Central Scenario, electricity use in buildings is predicted to almost double from 11 petawatt hours (PWh) in 2014 to around 20 PWh in 2040, requiring large increases in power-generation and network capacity. Improving the operational efficiency of buildings by using real-time data could lower total energy consumption between 2017 and 2040 by as much as 10% compared with the Central Scenario, assuming limited rebound effects in consumer energy demand. Cumulative energy savings over the period to 2040 could amount to 65 PWh – equal to the total final energy consumed in non-OECD countries in 2015. However, there is a flip side to this – smart controls and connected devices consume energy in order to maintain connectivity, even when in standby mode which can itself be a significant source of energy demand. For example, smart lighting could consume as much as 25 kWh per light fixture if running 24 hours per day all year-round. Some connected lamps consume more energy per year in standby mode than when actually in use, cutting their net energy efficiency by more than half. 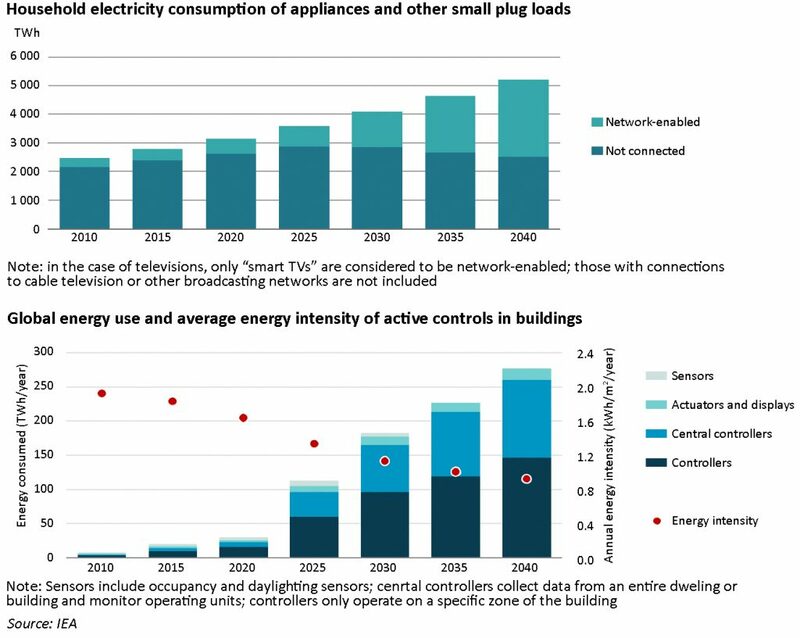 The overall growth in energy use from connected devices in buildings, both “smart” and “dumb”, was estimated at 360 TWh or 13% of total household electricity consumption for appliances and other small plug loads in 2015. In the IEA Central Scenario, 50% of household electricity demand for appliances by 2040 is expected to come from connected devices, presenting opportunities for smart demand response but also increasing the need for standby power. There is much talk of how Electric Vehicles (“EVs”) are the solution to de-carbonising the transport sector, however their deployment presents significant challenges and some opportunities for the electricity sector. The challenges are around providing the necessary physical charging infrastructure and ensuring there is sufficient generation capacity to meet this new major demand source. The opportunities lie in the potential for EV batteries to provide DSR services to the power grid. Allowing aggregators or system operators to remotely control connected EV batteries means that charging can be shifted away from times of peak demand, while allowing the benefits of large amounts of electricity storage to be realised. Of course, the technology must allow for EVs to be available for use when needed, so service providers will need to develop processes for managing availability for users. The IEA forecasts that in a scenario where 150 million EVs are deployed by 2040, the capacity needs for standard EV charging will reach 140 GW. If smart charging were to be deployed, this capacity requirement would potentially fall to 75 GW, avoiding hundreds of billions of dollars in infrastructure expenditure. Businesses are increasingly investing in IoT systems to improve efficiency and productivity. According to research firm Gartner, around a third of the 11.2 billion connected “things” in use globally by the end of 2018 will be implemented by businesses. Research by the Wi-SUN Alliance found that oil and gas companies and utilities ,with their long track record of using SCADA and ICS platforms, are leaders in IoT technologies, with the IoT utilities sector potentially being worth US$15 billion by 2024. 99% of IT decision makers described seeing tangible improvements in areas including: business efficiency (54%), customer experience (49%), collaboration (48%), business agility (47%), and reduced costs (45%). Examples include Florida Power and Light which has used advanced metering infrastructure and automated feeder switches to boost resilience in the face of frequent storm-related outages – the firm claimed it avoided 118,000 outages and restored power within two days to 99% of others affected during Hurricane Matthew. 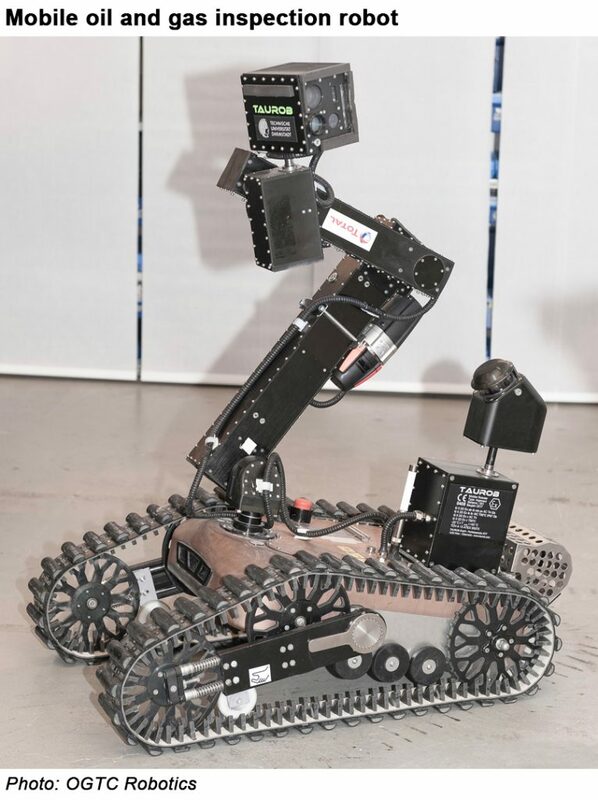 This week Total announced that it was collaborating with the Oil and Gas Technology Centre (OGTC) and Austria’s Taurob and Darmstadt Technical University, on developing an autonomous robot that can perform routine tasks and respond to challenges in a simulated oil and gas operational environment, with the aim of deploying robots on rigs in the future. With this increasing digitisation of energy comes a new risk of cyber threats, not just in equipment that is taking advantage of new networking technology, but in older equipment where there is a growing awareness of the vulnerability to hacking – the US Department of Homeland Security and FBI have warned recently about the threat from state-sponsored cyber hacking originating in Russia, with Energy Secretary Rick Perry being quoted as saying that cyber-attacks are “literally happening hundreds of thousands of times a day”. At the end of March, the UK Government announced that it has set up an industry taskforce to develop a strategy to restore the grid in the event of a nationwide power failure triggered by a cyber-attack. Concerns over potential Russian cyber-attacks on the UK’s energy infrastructure have also increased over the last year, although threats come from other countries and from individual hackers. A regulatory framework for cyber security in critical sectors is due to be implemented by May 2018. According to a report from Accenture, almost two-thirds (63%) of utility executives believe their country faces at least a moderate risk of electricity supply interruption from a cyber-attack on electric distribution grids in the next five years. This figure rises to 76% for North American utility executives. Utilities and grid operators must invest in effective response and recovery capabilities, as well as improving grid resilience, at the same time as they are also adapting to the transformations driven by de-carbonisation. This will require stable, reliable and secure communications networks, and ensuring that every new device that connects to the grid is protected regardless of size. Potential security measures include discontinuing older security protocols in newer technologies that are regularly updated to address recent published vulnerabilities. Data encryption is essential to protect both system and personal data stored on shared services. In addition, the same “big data” techniques being used to respond to changes in supply and demand patterns can be used to identify and address problems in the system whether caused through deliberate cyber or physical attacks, or by non-malicious phenomena such as lightning strikes. In the IEA Central Scenario, the implementation of the full technical potential of demand response would result in about 185 GW of additional flexibility for the electricity system globally in 2040 avoiding US$ 270 billion of investment in new infrastructure. However, the IEA notes that while the potential benefits to the entire system are significant, the potential savings to individuals may not be large enough to incentivise them to participate in DSR schemes. However, as the electricity sector takes on a more services-oriented approach, it is entirely possible that new models will emerge with DSR embedded within a services-oriented approach to energy provision. Service providers would supply the outputs of energy provision – customer-defined levels of comfort (heating/cooling), food maintained at desired temperatures (chilled or frozen), appliances such as washing machines operated to deliver clean clothes at pre-determined times. As energy and digital technologies converge, opportunities for tech companies in the energy sector will develop. It is not obvious that IoT development should be driven by energy companies or energy policy, and opportunities exist for technology companies such as Google and Amazon to develop domestic energy services platforms. Energy shares certain similarities to the telecoms space, where services have been largely divorced from infrastructure provision (the key differentiator being the greater importance of security of supply in energy). In a services-oriented world, where providers deliver comfort levels and energy functionality to consumers rather than selling energy itself, these capabilities could form the core value proposition for energy services providers – key competencies that sit comfortably (arguably more comfortably) in the technology arena than the energy sector. 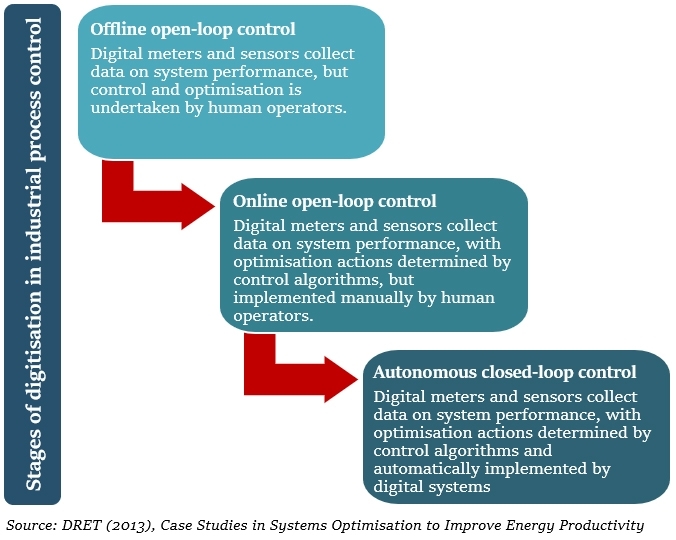 The digitisation of energy provides opportunities and threats for different market participants. Keeping abreast of technology change and the associated changes in regulatory and commercial market structures will be essential to compete in the changing energy environment. Why not create another expensive attack vector for hostile parties?